Mount Saint Helens - Universe Galaxies And Stars Section. Infrared View of Mount Saint Helens. NASA scientists flew a small aircraft equipped with a special Infrared camera above Mount Saint Helens last week to see if this perspective would give any insights into what's happening underneath the surface. Shortly after they took this image, the Volcano spewed out a large blast of steam. The team had actually been planning this mission for quite a while, so it was a complete coincidence that they arrived when the Volcano was about to erupt. 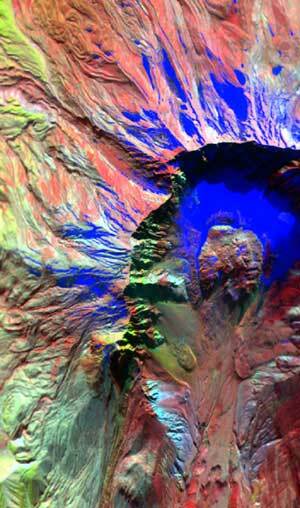 NASA scientists took Infrared (IR) digital images of Mount Saint Helens' last week. The images revealed signs of heat below the surface one day before the Volcano erupted last Friday in southern Washington. The images may provide valuable clues as to how the Volcano erupted. Scientists flew an IR imaging system aboard a small Cessna Caravan aircraft over the mountain to acquire the data. "Based on the IR signal, the team predicted an imminent eruption," said Steve Hipskind, acting chief of the Earth Science Division at NASA's Ames Research Center (ARC), Moffett Field, Calif.
"We were seeing some thermal artifacts in the floor of the Mount Saint Helens' crater in southern Washington," said Bruce Coffland, a member of the Airborne Sensor Facility at ARC. " We flew Thursday and used the 50-channel MODIS/ASTER Airborne Simulator (MASTER) digital imaging system. We are working to create images from the IR data that depict the thermal signatures on the dome," Coffland added. MASTER is an airborne simulator instrument similar to the Advanced Spaceborne Thermal Emission and Reflection Radiometer (ASTER) high-resolution Infrared imager carried on NASA's Terra Earth observation satellite. scientists plan to fly the MASTER instrument again over the Volcano early this week. The ARC airborne sensor team was in the area taking data for a United States Geological Survey (USGS) study examining some of the effects of the 1980 Mount Saint Helens' eruption. "This had been planned for some time, and we were there totally by coincidence," Coffland said. The science objectives for the USGS study were to outline the boundaries of the lava flows associated with Mt. St. Helens' previous eruptions in 1980. "We flew four flight lines over the mountain," Coffland said. "It's a continuous scan image, eight miles long (13 kilometers) and about 2.3 miles (3.7 kilometers) wide." There were four adjoining flight lines flown for Joel Robinson, an investigator at USGS, Menlo Park, Calif.
After the plane landed, technicians downloaded data from a computer hard drive, and began to process the data to produce an image format for use by scientists. NASA will post the pre and post eruption Infrared images on the Web. Sky Research, based in Ashland, Ore. provided the Cessna Caravan, a propeller driven, single-engine airplane that carried the IR imager.